4CellView is an autofocused observation microscope which allows timelapse observation. 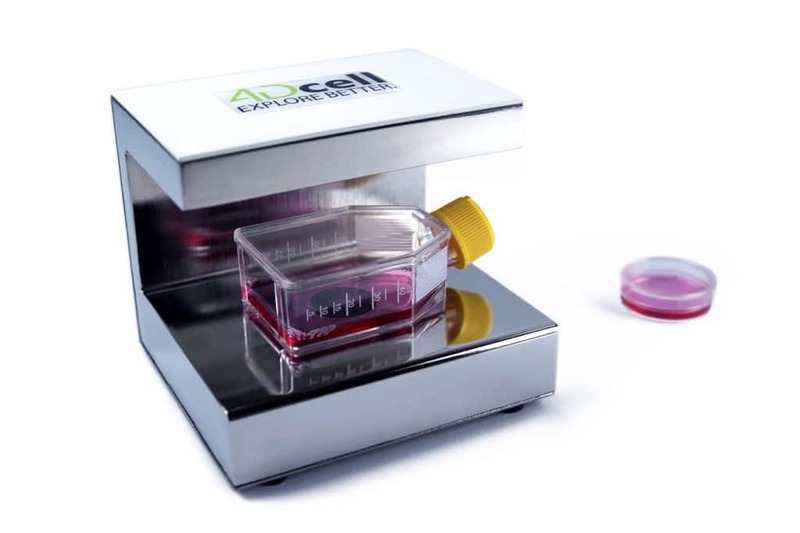 Compatible with all standard cell culture systems, this tool can record moving images and be used for several kinds of cell assays: cell division, migration, counting, viability, etc. Its small dimensions make it fit within any incubator or hood : 132 cm² foot print. Use any standard lab T-flasks or dishes: the microscope is compatible with every cell container. The 4CellView carries a lensless technology freeing it from focus, britghtness or other settings adjustments. The algorithms take care of all parameters! Record your cells for a long time period varying the delay between acquisition. Please be aware that the 4CellView cannot be used with PDMS substrates. The 4CellView is provided with an analysis software. The data collected from the acquisition surface of 29.4mm² enables to focus on a huge amount of cells at a time. Real-time Imaging of cell culture: go through the time lapse! Live cell imaging: Place the 4CellView inside the incubator and observe your cells. Cell migration: Chemotaxis and wound healing assays on large areas with high confluence. Cell proliferation: automatic cell count, confluence analysis.